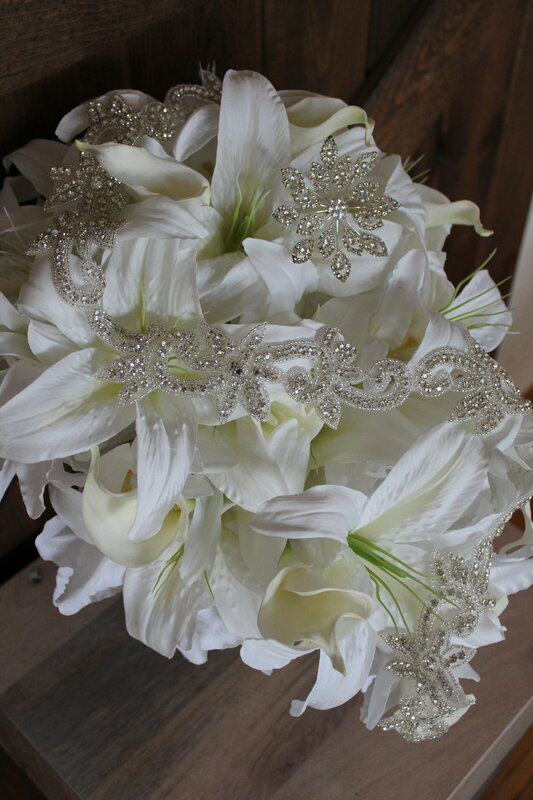 Here's another beautiful artificial silk wedding flower bouquet with even more sparkles! This beautiful cascading silk flower bouquet is simple in design--just Garden and Calla Lilies--but it's breathtaking with all the bling! One way to really up the shine factor was to include this awesome bouquet handle wrap that is just dripping with rhinestones. It's the same one I used on this and this bouquet. In the bouquet, I added a starburst broach and draped a rhinestone and beaded sash to really accent the shape of the bouquet. I wish you could see the bouquet in person because the pictures really don't do it justice! What do you think? Too much? Not enough? If you like the design but want to put your own spin on it, contact me today to start designing your dream wedding flowers!